Last Saturday in Las Vegas, the Republican Jewish Coalition (RJC) welcomed President Trump with wild applause and a display of red “MAGA” yarmulkes that may leave some with the impression that Republicans are making inroads with Jewish voters. In reality, Trump’s presidency has contributed to a stunning loss of Jewish support for Republicans, which plummeted from 33 percent in the 2014 midterms to 17 percent in the 2018 elections. 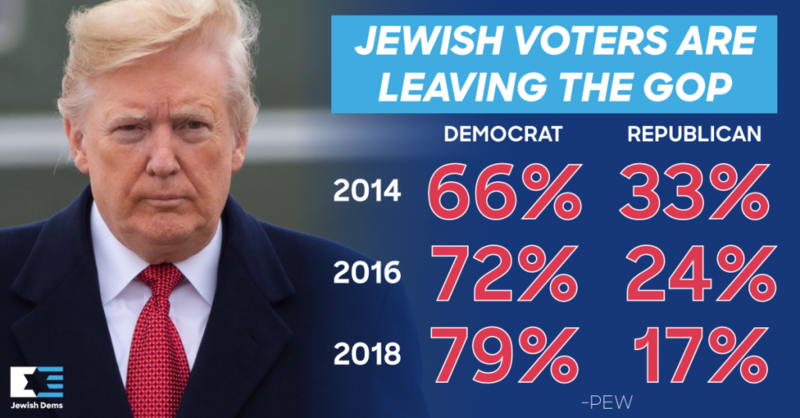 Between 2016 and 2018, the numbers dropped by seven points, demonstrating that Jews are leaving the GOP because of Trump. Trump’s presidency has caused Jews to abandon the Republican Party because his rhetoric and policies are contrary to our Jewish values. The Democratic Party has been – and will remain – the political home of the Jewish community because Democrats share our commitment to Israel and other domestic policy priorities stemming from our Jewish values. Jews also reject Trump’s attempt to turn Israel and anti-Semitism into political wedge issues, which has been dangerous for Israel and Jews. But don’t take our word for it – the polling numbers speak for themselves. At the RJC Shabbat political rally, Trump referred to Benjamin Netanyahu as “our” prime minister. This was the second time in just a few months he had made a dual loyalty accusation about American Jews and Israel. And as usual, Republicans who are so quick to condemn anti-Semitism from the opposite side of the aisle remained silent when Trump engages in the same bigoted ignorance. It’s unacceptable that Trump and other Republicans have engaged in anti-Semitism, but it is also unacceptable that they only seem to care about anti-Semitism when it suits their partisan purposes. This opportunistic Republican tactic is not just hypocritical, it’s dangerous and makes the following clear – Trump and the GOP are using Israel and anti-Semitism as political wedge issues in order to score political points, as we won’t let them get away with it. 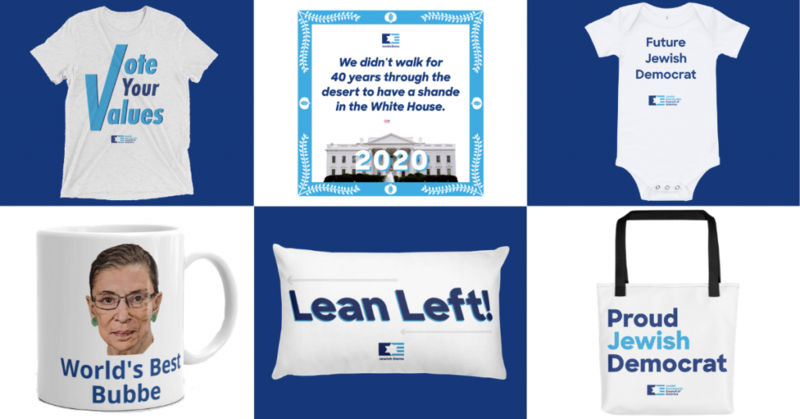 • Support JDCA today to help us elevate and amplify our effort to set the record straight on which party aligns with Jewish values. • Sign – and share! – our petition demanding that Trump denounce anti-Semitism and stop engaging in it himself. 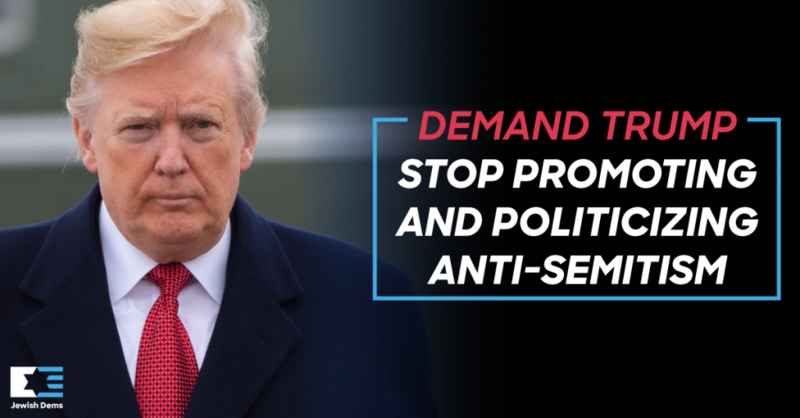 • Read an op-ed written by JDCA Executive Director Halie Soifer denouncing Trump’s intervention in the Israeli election and ongoing attempts to politicize and personalize the U.S.-Israel relationship. • Join us today in advocating for our values by TAKING ACTION with JDCA on critical issues such as healthcare, gun safety, and climate change. Our work is not possible without your support, and we thank you for standing with JDCA as we continue to fight for socially progressive, pro-Israel, and Jewish values.